It’s hard enough for an established music star to put together a surprise album release, but it must be even trickier for a name-brand filmmaker to assemble a surprise movie release. Yet that’s just what Michael Moore has done: Yesterday he announced the existence of his new film Michael Moore In Trumpland, adding that a free preview screening would be held that evening at the IFC Center in Manhattan, ahead of a theatrical release beginning the next day at that same venue and at the Laemmle Town Center Five in the Los Angeles area. We’ll have a review of the film shortly. At the movie’s de facto, seemingly impromptu New York premiere, Moore spoke before and after the screening, before a crowd of press, MoveOn.org volunteers, and line-waiters who stuck it out for hours on an unseasonably warm fall day for tickets. The crowd outside the IFC Center was big and restless, gathering around an automated Trump fortune-teller (you know, like the magical one in Big, except spewing hateful invective), sometimes holding light-up anti-Trump signs, and generally creating headaches for the poor IFC Center staffers. It turns out everyone was waiting not for another documentary/cinematic essay from Moore in the style of Bowling For Columbine or Sicko, but rather for a concert film capturing a one-man show of sorts that Moore put together earlier this month. Before the screening of the 73-minute movie got underway, Moore revealed that it was shot in early October in Wilmington, Ohio (the symbolic swing-state “TrumpLand” of the title), after another Ohio location fell through at the last minute. One of the two performances went on just hours after the October 7th release of tapes wherein Trump discussed sexual assault tactics with Billy Bush. To facilitate a bonkers 11-day turnaround from shooting to finished product, Technicolor donated post-production services, which apparently finished that very morning; Moore reported that they locked the film at 7 a.m. on Tuesday. The theatrical release is beginning with the New York and Los Angeles runs, but Moore mentioned, without giving much in the way of specifics, that there would be an online distribution plan revealed within the next day or two on his website (as yet not updated) and that MoveOn.org would be putting together watching parties in conjunction with local canvasing and phonebanking. This isn’t necessarily one for the ages; the movie is very clearly intended as agitprop, perhaps even more so than Moore’s other films, for the cause of electing Hillary Clinton—whose prospects Moore does not find as bullish as some other pundits, citing his sometimes paranoid-sounding distrust of poll numbers. At the Q&A after the film, Moore held forth for more than half the running time of his film, often giving long (and sometimes repetitive) answers to fans’ questions about how his film fits into his views on the upcoming election. Moore was aware of his tendency to go on, repeatedly promising to keep his answers to “20 words” in order to fit in more audience questions. As in the film itself, his passion came through even when expressing conflicted, if ultimately net-positive, feelings about Clinton’s candidacy. Moore supported Bernie Sanders during the primaries, and while his film uses Trump as a hook, it more clearly speaks to voters who may have felt motivated by Sanders and less so by Clinton, as well as potential third-party voters in general. He urged the audience against feelings of complacency even with Trump’s falling poll numbers. Despite this cautiousness, he spoke repeatedly of a strange optimism that things will, on the whole, continue to get better even as Trump stokes the fires of some of the country’s worst instincts—provided progressive voters do band together behind Clinton on November 8. 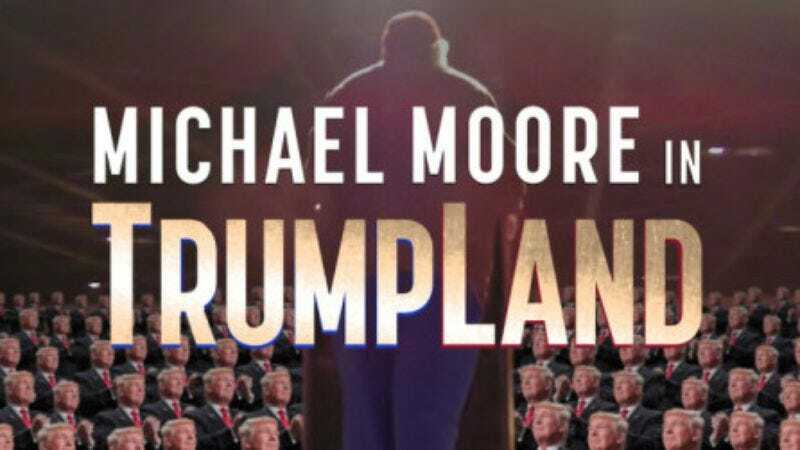 Viewers can see for themselves whether Moore succeeds in energizing audiences as Michael Moore In Trumpland plays theatrically over the next few weeks (Moore spoke of other theaters in other cities wanting to book the film in the last stretch of time before the election), and as it becomes available for online viewing in the coming days, most likely via iTunes.